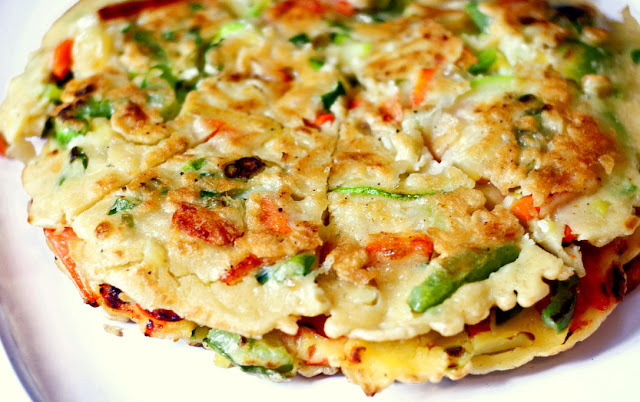 ﻿﻿﻿Korean pancakes (pa-jeon) are a popular appetizer or side dish in Korean culture. It's hearty and filling enough to be a meal in itself. Pa-jeon is absolutely amazing when eaten piping hot straight off the stove. So wonderfully savory and delicious. It's usually served with a dipping sauce consisting of soy sauce, vinegar, and sugar. 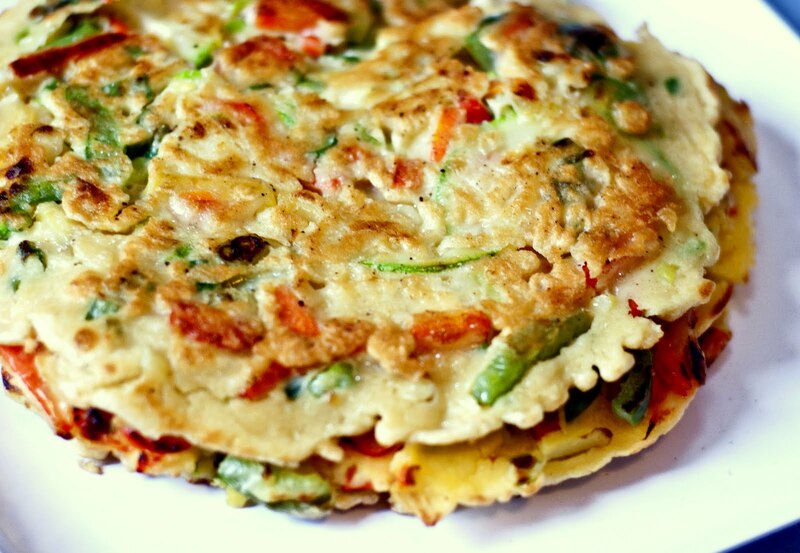 You can find many variations of the pancake - most common are scallion, kimchi, or seafood. Seafood pancake (called hae-mul pa-jeon) is my absolute favorite; it consists of squid, clams, shrimp, and scallions. I normally use a prepared pancake mix bought from the Korean market . But I didn't have any on hand. Nor did I have any seafood. So I decided to make vegetable pancakes using flour. If you have some fresh veggies, flour, water, and egg available, this is a simple meal to make. Don't make the pancakes too thick. Otherwise, they're bound to be soggy. Don't be stingy with the oil. In the past, I tried using as little oil as possible to keep them from being greasy and it would be a flop (literally). You don't want to go overboard with the oil, either; these are not meant to be deep-fried. Just be sure to use enough to coat the bottom of the pan. In a medium bowl, mix flour, egg, salt, and 1 1/2 cups water until a smooth batter is formed. 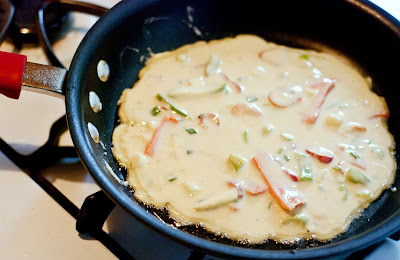 If batter is still thick, add a little more water (you want it to be the consistency of pancake batter). Stir in the potatoes, carrots, peppers, and scallions. Place an 8-inch nonstick skillet over medium-high heat. Let it heat for 15-20 seconds, and then coat bottom with vegetable oil. 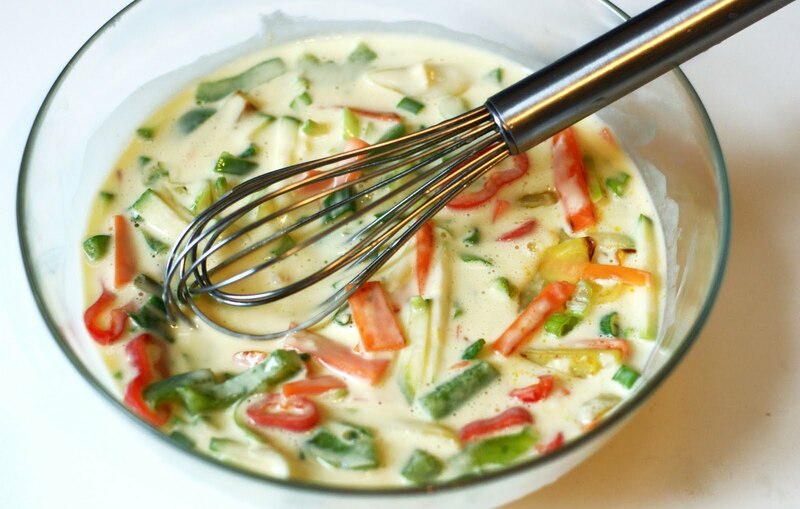 Ladle in about a quarter of the batter and spread it out evenly into a circle. Cook for 5 minutes until edges start browning. Then flip and cook for another 3-5 minutes. When completed, transfer the pancake on a plate lined with a paper towel to drain oil (if necessary) and then place on serving plate. Repeat steps 1 to 3 with remaining batter. 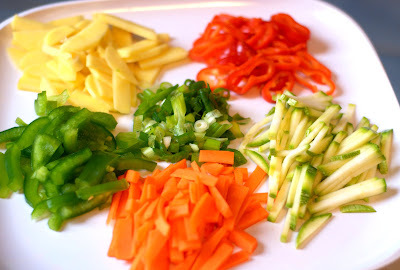 When pancakes are all finished, cut into wedges and serve with dipping sauce. In a small bowl, mix together soy sauce, water, vinegar, sugar, and sesame oil. 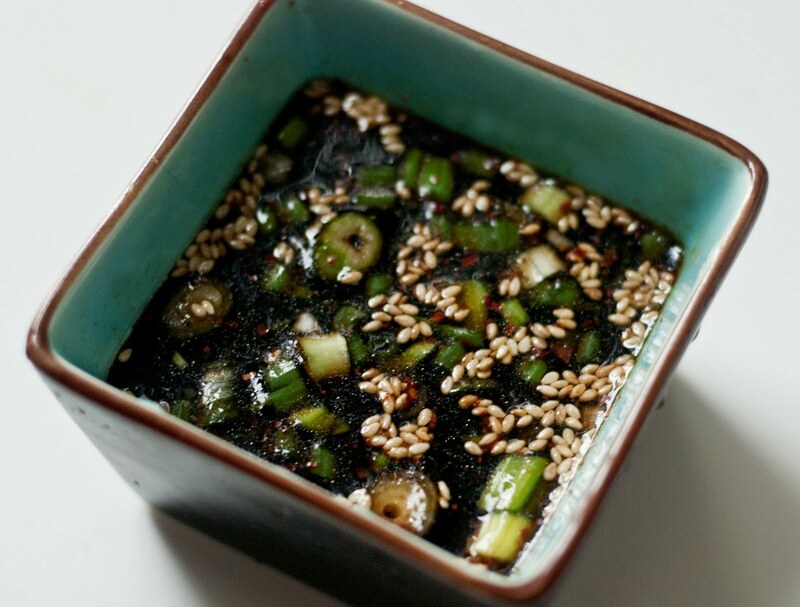 Sprinkle in sesame seeds, chopped scallion, and if desired, pinch of red pepper. I love the photos of your little boy enjoying these pancakes! Priceless! @Lillian - The already made Korean pancake mix is great, too! It consists of diff't flours (wheat and rice), corn starch, and salt. I had some in the pantry but I realized it was expired. Ugh. So I used flour and egg instead which works just fine. @Christina - Thank you! It makes a mother incredibly happy to see her children enjoy the food she prepares. Your son is too cute! And he loved your pajeon! Looks delicious. Thanks for stopping by my blog! Can't wait to try these out! My kids are going to love this! These look and sound so mouthwatering. I love the photos of your son, so adorable! Thanks for sharing and I love Korean food and was little scared to make it at home. will def. try all these. I love those joyous photos at the end of this blog post. I made these for the first time last night and looking at your photos, I went overboard with the vegetables! But they were tasty - thanks. I substituted the potato for sweet potato because that's what I had and it worked well.